Whilst pottering about in Cornwall (South Coast) I was wandering around some of the small, picturesque villages and harbours …. 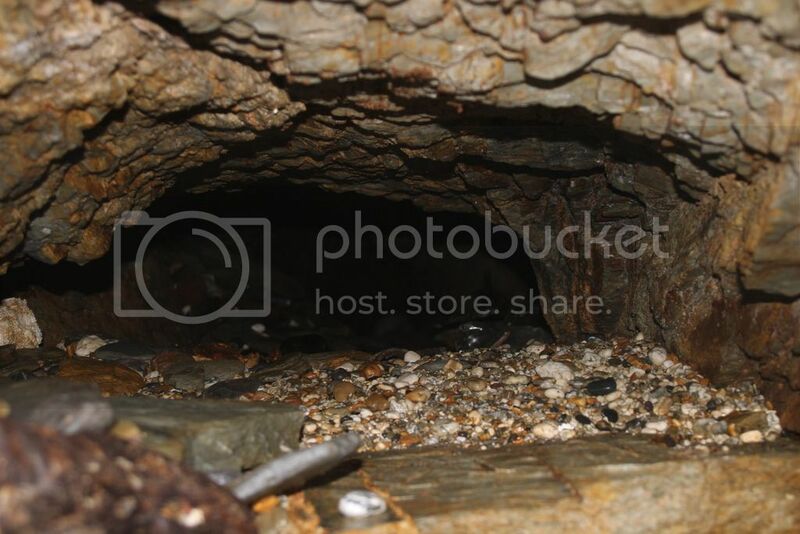 In Charlestown (just below St. Austell) I found a “sea cave” that appears to be a “traditional cave” (in the sense it isn’t a cave created by sea erosion). It is located in the cliff face around 100 yards from the harbour on the right as you look at it from the sea (or it is on the left side of the harbour if you approach the harbour from the road heading towards the sea). A significant amount of water is coming out of the cave and running across the beach and into the sea. (that’s the giveaway). At first glance I thought it might be a mine adit but the inside tapers immediately and there are no tool marks. 30 feet into the cave the roof drops down to a flat crawl of no more that 18 inches (more if you scoop the floor out). However, I did not have a lamp (only a pen torch light from my old fashioned mobile phone) and I could not undertake the flat crawl because I was not properly dressed and the running water would soak me leading to a major bollocking from my wife. Although the photo is hopeless (because the flash bounces), I could see that the flat crawl was less than 6 feet and then the cave appeared to open up again. 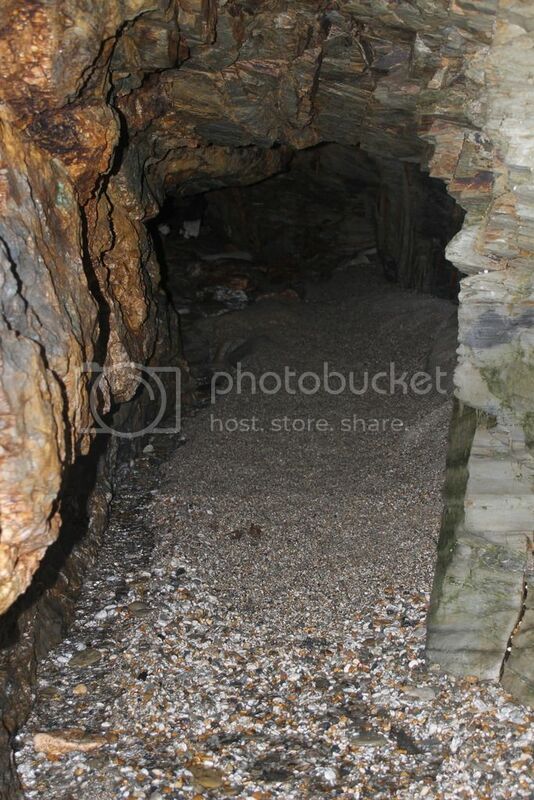 Does anyone know anything about this cave and is it worth “pushing”? It looks suspiciously artificial to me. One possiblity is that it is an old sewage outlet or storm drain equivalent. You might think the old sewage outlet at Hope's Nose in Torbay is natural on first inspection. She doesn't go in far enough - as she approaches what appears to be the end, the cave continues low and to the left of the camera. You can, however, see the water running out. I Googled again (using Cornwall) and found a CBC report but it isn't the same hole. 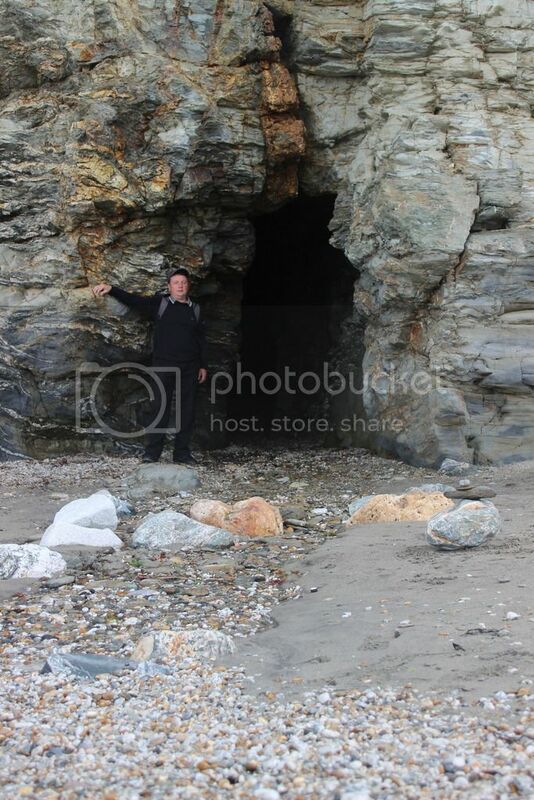 There are many tunnels in the harbour (dis)used for historically loading ships in the quay (now a visitor attraction) - this is (apparently) a cave in the cliff face on the beach. Haven't you go a book about it Tony? Yes. Do you want to read my description? It will cost you. Charlestown (Cornish: Porth Meur, meaning great cove) is a village and port on the south coast of and is 2 miles (3 km) south east of St Austell. The cave may be a sewer or a leat. Have a look at the references and decide for yourself. accessed 010716 3description and 3 photos. “There are a number of small caves in the cliffs but beware of rock falls. The second reference is a different cave on the other side of the harbour which is a (apparently) traditional sea cave (caused by sea erosion only). Any chance I can have my £10 back? Charlestown had iron mines, there's definitely iron in the vein above hole & it would have continued into the now open space - looks like it's man-made but sea has probably eroded the evidence. Have a look at the Carbis Bay Crew's web site. I suspect this tunnel is associated with the leat. I have been looking at some of their stuff (they obviously have a lot of fun down there ). It may be connected to the tunnels they were in that they could not pass and I am tempted to accept it is a drainage adit. If it is, the sea has significantly distorted it. I couldn't find anything on CBC that suggested it connected though. TAny chance I can have my £10 back? That looks like a crosscourse structure in the top of it. A fault consisting of quartz, clay and some low temp minerals like iron. The major Charlestown United adit comes out in the basin and this is blocked. Whilst the mine plans are not very good in this area, there is a very obscure one which shows the path of the adit level from Buckler's Mine (By the main road) and it's course to the basin. Along this are marked many other lodes. Presumably, some of them have workings along them. The main source of water on "that side of the beach" was an adit in the corner and this went into some stoping and then what appeared to be a shaft choke. The water appeared to be coming up stoping. This was probably working it's way through the workings (poorly recorded). This has now been totally obscured. There was no need to go driving levels on structures when the same structures were proven by other tunnels in the area. However, IIRC, there is a tunnel (choked with horrible things) running from the bottom of this. This could have been done for a number of reason....general old mans trial workings, perhaps the crosscourse is a low angle caunter lode and does carry values of some description (unlikely) and this is the reason for the trial. Either way, it's all very old in that area and poorly recorded. I agree with disgusted, there are many old mines in the area and the "cave" (I've visited it) appears to be on a crosscourse so it#s probably in effect a crosscut to intersect lodes. To give some idea of how poorly recorded the mines are, several years ago I was pottering around in the woods on the way down towards Carbis Bay, prior to them being felled to make way for a housing development. I located at least 20 shafts, a couple of which went at least to sea level (a couple of hundred feet), and at least one was an engine shaft. My research indicated it was probably the site of Appletree Mine, a sizeable copper venture with no existing plans. I spoke to a guy who claimed he was the site foreman and he told me he didn't know which mine it was but it didn't really matter as they were going to cap the shafts and spread the (largely pyritic) dump material around and then cover it with topsoil. Nowadays you wouldn't even know a mine existed there. It's possibly but unlikely that the adit at Charlestown goes through this property. I have a feeling that Appletree aka South Crinnis is on the same adit system as Wheal Regent. The charlestown united eliza consols adit is very much blocked. Some of the lodes run into Polmear, but nothing running all the way through. If the adit was clear, it would be a very interesting trip. I'm off to Cornwall at the end of August, staying nr. Tavistock. Anything easy and interesting nearby? Bearing in mind I'm the only caver type going? Any info gratefully received. Thanks for the info - most appreciated. Where can I find such a book from an honest bookseller??!??? If you pay by PayPal, please send me an email to confirm this. Otherwise, a cheque is OK to me at the address below..